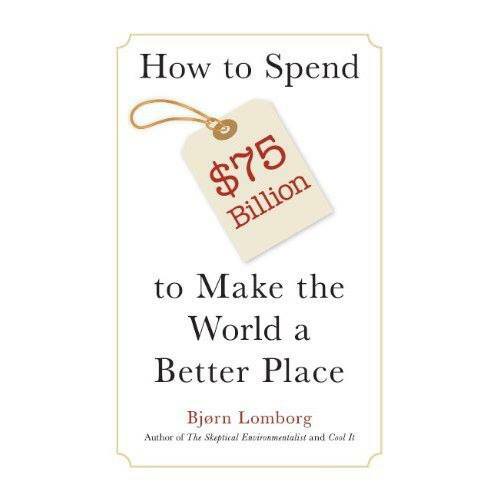 Bjorn Lomborg is Director of Copenhagen Consensus Center and author, most recently, of How to Spend $75 Billion to Make the World a Better Place. 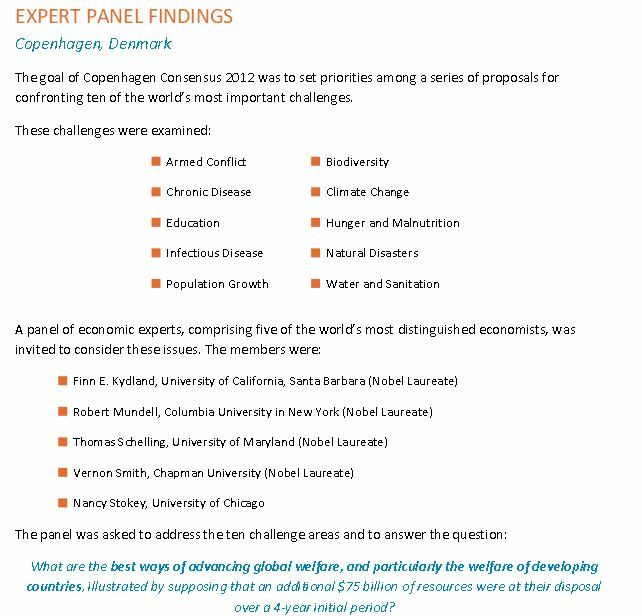 Copenhagen Consensus Center brings together many of the world’s top economists, including Nobel Laureates, to set priorities for the world. Dr. Lomborg is among TIME Magazine‘s 100 most influential people in the world; one of the 75 most influential people of the 21st century, according to Esquire Magazine; and one of the 50 people who could save the planet, according to the UK’s Guardian. Dr. Lomborg is a frequent commentator in print and broadcast media for outlets including the New York Times, Wall Street Journal, the Guardian, CNN, FOX, and the BBC. His monthly column is published in 19 languages, in 30+ newspapers with more than 30 million readers globally. Dr. Lomborg is also the author of the best-selling books The Skeptical Environmentalist and Cool It, in which he argues that many of the costly measures and actions adopted by scientists and policy makers to meet the challenges of global warming will ultimately have minimal impact on the world’s rising temperature. How to Spend $75 Billion to Make the World a Better Place by the Copenhagen Consensus Center builds on the Copenhagen Consensus 2012 which gathered expert panels of outstanding economists to deliver ranked lists of the most promising solutions to ten of the most pressing challenges facing the world. The project involved around 60 leading economists and specialists in ten global challenges, including several Nobel Laureates. Foreign Policy Concepts spoke with Dr. Lomborg to discuss his new book, priorities, as well as the methodologies used in his projects at the Copenhagen Consensus. A key argument by the Copenhagen Consensus (CC) is that solving the world’s key challenges is based on the philosophy that international bodies, governments, and philanthropist organizations make decisions without fully taking into account a comprehensive view of the effects of their decisions. These decisions, according to CC, are made with very little information on their costs and benefits. Elaborate on what sets your approach apart from those of existing organizations in offering solutions to the world’s key challenges? The biggest difference between the Copenhagen Consensus and other organizations is that we try to focus on most bang-for-the-buck, and this often leads us to focus on the critical issues that get less media attention. The political system, on the other hand, tends to focus on which problems have the loudest campaigners, the best PR, or the cutest animals. Our topics might seem duller in comparison, but the numbers back us up. Take, for instance, the environment. What is the world’s biggest environmental problem? Most discourse focuses on global warming, but the biggest problem by far is in fact air pollution. It is not an issue that receives adequate attention in the developed world, but each year indoor air pollution caused by contaminated heating and cooking fuel kills about 3.5 million people, mostly women and children, in developing countries. That alone accounts for nearly seven percent of all deaths in the developing world, more than a hundred times the combined deaths of severe weather, heat, and drought. Air pollution is just one example, but it is a problem we know how to address and an area where we can make a real difference. At the end of the day, we all want to make the world a better place. But I don’t think our kids and grandkids are going to applaud us for having made heart-felt speeches about the issues or spending a lot of money, inefficiently on intractable problems. We need to take smart action. The Copenhagen Consensus cuts through the hyperbole that characterizes a lot of work on “marquee” problems and emphasizes the best, if sometimes ignored actions to take. We present a straightforward, clear narrative on where we can do the most good. 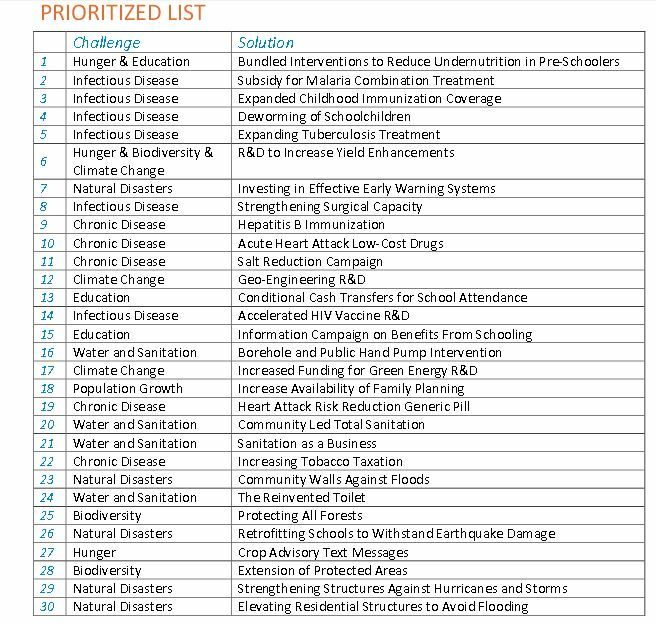 From the perspective of Copenhagen Consensus, what does “an informed ranking of solutions to the world’s big problems” mean? Our approach to solving these big problems is based on cost-benefit. While that might seem cold, it comes from the simple realization that we work in a world defined by limited resources. If we sometimes choose to invest in solutions with high costs and low return, we can’t spend that money on smart solutions with high benefits. Now compare that to an issue like malnutrition. Nearly one billion people go to bed hungry each night, and nearly half of the world’s population lacks one or more critical micronutrients. That’s a significant problem any way you look at it. What we found is that one of the best investments we make to solve this problem is investing $3 billion annually to purchase a bundle of nutrition interventions, including micronutrient provision, complementary foods, treatment for worms and diarrheal diseases, and behavior-change programs, all of which could reduce chronic under-nutrition by 36% in developing countries. For every dollar spent, you could get a return of about $59 of good. That is an incredible investment and amounts to only a tiny fraction of what we’re talking about spending on global warming, and you could actually make life a lot better for hundreds of millions on this planet. Although it may seem that way, picking solutions based on return on investment is not a cold way to approach development, but an essentially moral way to ensure we do the most good. We must acknowledge that we operate in a world of limited resources. This is the gist of all of our projects and most clearly in one of our latest books, titled How to Spend $75 Billion to Make the World a Better Place. You argue in your book that “refusing to put a value on human life does not help to save lives” and that putting numbers to evaluate human lives helps us better evaluate our choices in formulating policies. Can you explain how this value system helps us devise policies more effectively and more economically? It is often seen as immoral to put a price tag on lives – and, of course, in a perfect world, all lives would be priceless. But real policy decisions mean that some lives get saved while others don’t. Say that politicians could build a roundabout for $9m and save one life. If the roundabout does not get built, it means that the politicians valued that life at less than $9 m. In general, most public and private decisions implicitly give us an indication of the worth we place on saving a statistical life. One great example of how we actually all make a tradeoff on human lives is the fact that each year, 40,000 people die on U.S. roads – and we know how to avoid virtually all of these deaths – we would just reduce the speed limit to 5mph. But, of course, no one would seriously propose this measure. We don’t do it because we weigh it against the benefits of faster transport, quicker connections and a continentally connected U.S., and we determine that the benefits that come with easier travel outweigh the cost. We can discuss whether the speed limit should be 45mph or 75mph, but nobody says 5mph. We have measured the cost and the benefits and decided that about 40,000 fatalities a year is worth the price of this speed and connectivity. Likewise, when choosing solutions within other areas we implicitly put values on human lives, and being upfront and honest about that is likely to help us do the most good possible. Do you think there is a lack of global leadership, political leverage and will on the part of governments in tackling transnational problems, some of which under study at the Copenhagen Consensus, that contribute to worsening of the situation on the ground in different parts of the world? There is definitely no lack of good will. However, there is a definite lack of good cost-benefit information and an understandable reluctance to engage in the discussion on best decisions. It can often involve unpalatable ideas, like explicitly assigning value to human lives or saying some, often popular, solutions are not the best way to spend money. What Copenhagen Consensus brings to the table is the ability to provide the uncomfortable but crucial information on where we find the smartest solutions. We get information on the most effective policies that do the most good for the most people for the least money into the international conversation. Essentially, we give tailwind to good solutions and head-wind for bad ones. It doesn’t make the decision-making process perfect, but it makes it better. One factor with great potential to contribute to the dynamism of issues and challenges raised in your book is the whole issue of culture. Could the inclusion of cultural issues and habits in tackling world’s key challenges alter the outcome of your reports and their prioritized ranking? I definitely agree that culture is an important contributor to making solutions viable. And within any discussion on choice of solutions, we do not just want to consider costs and benefits, but also distribution, justice and salience. But right now we have much too little information about costs and benefits and considerations of alternative uses of resources. That is the culture, that we’re trying to change with the Copenhagen Consensus. We try to get the prices and sizes of solutions into the main discussion. Has the Copenhagen Consensus looked at the problem of drug trade and worldwide distribution of narcotics as a factor in shaping some of the key challenges identified in your project? We haven’t directly, no. When we devise the list of issues we want to confront in the Copenhagen Consensus, we look at the ten areas in which we can do the most good. We tend to look at the problems with an eye toward promising solutions. If there are no good solutions to a problem, we will focus our energies on different areas instead. My concern is that, for the moment, it is difficult to find policy solutions to take on the illegal drug trade head on. The current solutions tend to be high-cost with few benefits, the most obvious example being the history of U.S. engagement in this area in Central and South America. That is not to say that the issue of drug trade has not come up in our work or that our work neglects the issue of narcotics completely. For example, a study for the 2004 Copenhagen Consensus showed that approximately 95% of the world’s supplies of hard drugs come from civil war environments. Our research, in the various iterations of the Copenhagen Consensus, has worked extensively on the topic of armed conflict. We believe we can find solutions to prevent these sorts of conflicts or aid in the economic recovery post-conflict. Both of these solutions would have the knock-on effect of putting a dent in the drug trade. But our crucial point is: there has to be a good solution. Take corruption. It is clearly a big problem. However, our analyses have so far shown that there are few concrete solutions to corruption. So, if we don’t know how to fix corruption, while we do know how to fix malaria, malnutrition, water, etc. – maybe we should focus most of our efforts where we know we can do good first. In many developing countries power relations at the elite levels of society shape the dynamics of many social, political, and health-care challenges. What is your take on these power dynamics and the obstacles they pose to implementing solutions to the challenges identified by your expert panels? You are absolutely right – there are many other factors that determine political outcomes. Both in developing and developed countries, factors like politics, ambition, or money play a huge part in the final outcome. But we’re all about rationality. Our goal is to point out what would be the best solutions given scarce resources. We’re not naïve enough to think that everything is only about rationality, but we push the notion that a well-informed group of policymakers will make better decisions. We point out how much good you can do with smart solutions and we stress how wasteful solutions cost a fortune while achieving little. This will not make a perfect world. But with smart, economic arguments we can make the world slightly less imperfect. And that is no small feat. PreviousPrevious post:Ayham Kamel on U.S-Iran RelationsNextNext post:Could Rouhani Prove Disruptive?